November » 2008 » Harrumph! 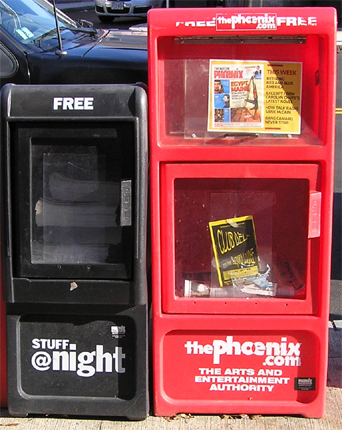 The old Pez-container newspaper boxes will soon be gone from the T, says Boston Phoenix/stuff@night Circulation Director Jim Dorgan. I was way off on the meaning of the deli-counter-style clear plastic versions I’ve suddenly seen at the Forest Hills T stop. He was kind enough to fill me in. Pix Trick: Click a thumbnail for a larger view. If it opens in the same window, use your browser back button to return. The freebies’ circ staff found a cheaper or sturdier box type. Heavy traffic Forest Hills would be a logical test location for weather and door-slammer durability testing. They wouldn’t go on the street locations until they proved themselves there. It turns out that it’s no test, nor is it a cost-saving effort by the Mindich crew. Instead, we’ll be seeing and seeing through many of these and the Phoenix/stuff team is only an early adopter. according to Dorgan, the MBTA is requiring that all publication boxes on its property be easy to check visually — basically transparent. He said that this is an outcome of the Democratic Convention when cops and Homeland Security folk realized how easy it would be to high nasty devices in the ubiquitous dispensers. The idea is that a security sort can walk by a row of these and scan them for evil objects from a distance. He asked what I thought of the new boxes. As a former biz-mag type, I noted immediately that the branding was an issue. 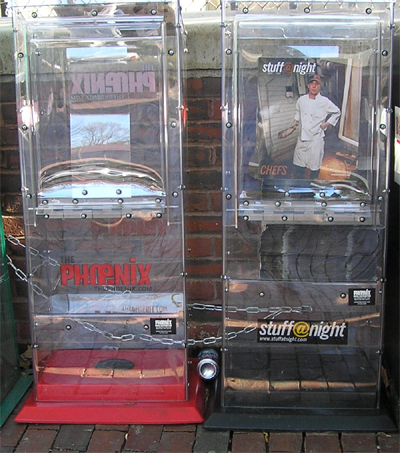 I knew that orange boxes were for the Dig and red, tall, rounded-edge ones were for the Phoenix. He admitted that was a concern, but noted that the MBTA will permit putting a copy in the front-door clip for customer convenience. Also, the box bases are subtler, but still distinctive. The Phoenix one, for example, has that wonderful garish red I associate with it. He said that this is an added expense for his papers and not any cost saving. The old boxes will be used on the street, either in new locations or as replacements as needed. They just began putting them in T stations a week ago, but will sweep the area very soon. Expect the same from the laggard pubs. I saw the second again this weekend when he was guest speaker at First Parish in Brookline. As with his King’s Chapel, where he was senior minister for three decades, 1st P’s parishioners are entitled and privileged by wealth and position. His willingness to tease the largely humanistic UUs with his overt Christianity might be enough, but he also enjoys jolting them out of their smugness. Last weekend, he sat expressionless during the candles. In UU vernacular, these are candles of celebration and concern lit by congregants. Supposedly they say a few words about something personal. I tend to think of these as candles of bragging and whining, and wince when one after another become prolonged rants. Quite predictably this time, many were in fact of celebration. It was, after all, the first service following Barack Obama’s election. Yet, behind Scovel’s glistening eyes, the not very tall but very thin preacher (he truly looks like hillbilly evangelists I saw in my childhood) was ready. He must be in his late 70s, but has the clarity of vision of an experienced and vital preacher. Rather than roll in the meadow of euphoria, he asked for transcendence. He reminded the almost entirely rich and almost entirely white folk that there are multiple ways of looking at the results. He asked us to get beyond the obvious and expect the other side to have its days again. He did spare us his Christianity though. In most UU churches on most Sunday’s, that’s wise. For a denomination/association that prides itself on its tolerance, we’re hardest on Christians. Over the years, I’ve heard parents at various Boston UU churches say their kids have learned more about Hinduism than Christianity. Out in the West and Southwest, I’ve attended UU churches where most congregants were raised Roman Catholic. They don’t mind Christ talk or images. In contrast, the former Catholic in some Boston churches can be downright hostile to those. Some speak of being abused by priests and hit by nuns. GLBT parishioners have tales of feeling denigrated for their orientation. Yet, the UUA’s president is an open Christian. Bill Sinkford has never downplayed or hidden that. Likewise, at Arlington Street, some of the finest people I have ever known are Christians. I think immediately of Dan Cheever, former chair of the board (the Prudential Committee) and generous benefactor to the church and association. He epitomized the ideal UU. In Brookline, the anti-Christian riffs are not hidden though. Oddly, that doesn’t seem to be a factor among the numerous parishioners raised Jewish, many of who still call themselves Jews. At the most recent annual Passover Seder, several Jews at the table said they had no problem with blending Christianity into the mix or even singing Christian hymns. Most UUs joined as adults and typically came from Methodism or other mainline Christian churches. How odd that they would take the best from other religions, while seeming to fear and dislike Christianity. Personally, I was a very devout little Christian, more so than the rest of my family. That’s past and I am no longer a Christian, but I don’t feel scarred by it nor do I think it cut me off from intellectual and spiritual growth. Perhaps Scovel will return and share some of his famous five-minute radio lessons. I can’t do a steady diet of King’s Chapel, even though it can be nice to sing hymns with the worlds I grew up hearing. Like most 1st P folk, I was on quite a political high five days after Obama’s election. I think it was good for us all to step back and take the longer view. There’s lots of time at home for clinking glasses. 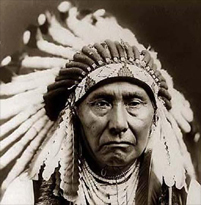 The director of engineering in the feathered war bonnet is the unfortunate image we relive each end-of-year. Back only about a decade ago, vice presidents of serious companies felt free to humiliate themselves at huge corporate parties. In this case, the fake Village People shouting out Y.M.C.A. were neither noble nor really even fun. You can be forgiven if your cynicism flashes there. For all the world, it is appearances that matter. We can suppose that if the financial world stirs at all, it’ll be champers and fish eggs all around again. In fact, the FT piece provides a hint of the waggish rebellion of our betters. 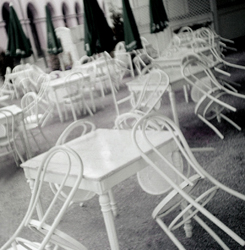 The thousand-person extravaganza may be temporarily gone. However, in New York as one example, there has been a flood of 20 to 30 person private-room functions instead. The swells can still party like it’s 1928, but hoi polloi and mere middle managers don’t get to play. Of course the great joke here is that those who cannot be denied and surely must deserve the luxury behind the closed door are the ones who led to our current economic chaos. Those who gambled with the corporate resources, making terrible marketing and design decisions, who counted on a never-ending growth spiral, and who blissfully took fliers on unsecured loans are still entitled. Meanwhile, as it is with the hives, the queens live on while the worker bees succumb to the winter. At the bottom, the party’s over for the time being. You are currently browsing the Harrumph! blog archives for November, 2008.